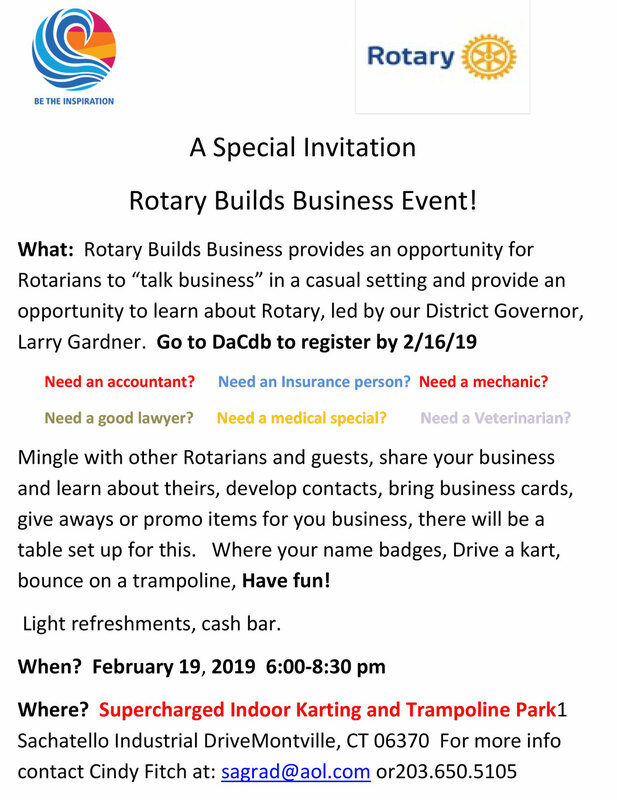 You’ve asked for it and here it is…the next District-wide Rotary Builds Business event will be held on February 19th at the Supercharged Indoor Karting and Trampoline Park, 1 Sachatello Industrial Drive, Montville Ct. from 6:00 – 8:30pm. Join us for a night of fun as we network among fellow Rotarians to share resources and help each other grow our businesses! Rotarians are invited to bring one prospective member to this event, as we’ve recognized that RBB can help attract new members. There is NO cost to attend, this is a FREE Event! Please pre-register on Dacdb clicking this link: Link to DaCdb for registration so that we will have an accurate headcount, as we will be serving light refreshments. And yes, there is a bar! Many thanks to Michael Whitehouse, VP of the Groton Club, for securing this exciting and creative venue for the evening…bring your racing gloves! Please keep in mind that you do not need to be ‘in business’ to attend! All Rotarians are ‘consumers’ and in need of products and services! Wouldn’t you rather do business with a Rotarian who follows the 4-Way Test than to Google-search an attorney, CPA, dry cleaner, wedding planner, etc?